Photos taken November 28, 2004. All views look north. I've been driving this 250-mile route frequently this year. I like this section of interstate. It's basically nonstop 70 mph with no cities from Conroe to Corsicana, and it's also fairly scenic. 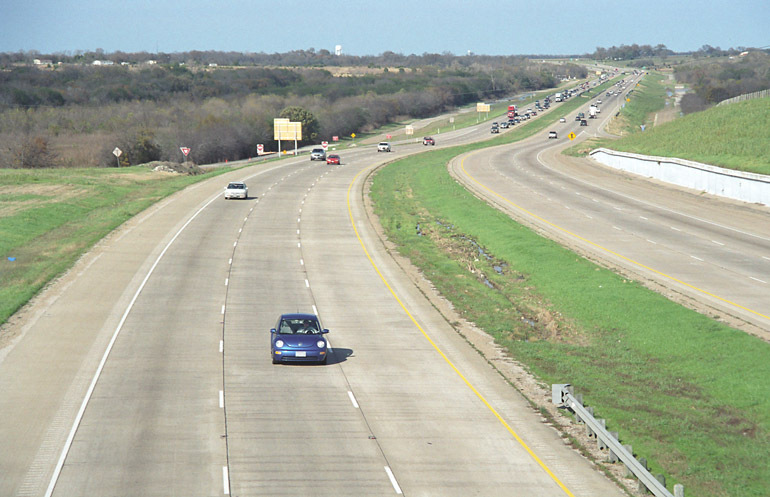 In fact, I rate it as the second most scenic section of Interstate in Texas, after I-10 northwest of San Antonio. 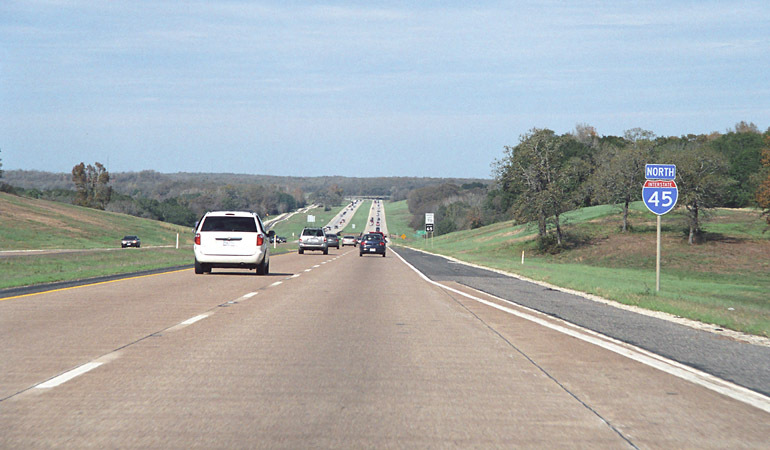 The later sections of I-45 to be built, from Madisonville to south of Corsicana, are very well designed with smooth grades and gentle curves. It is sooooooo much better than I-35 from Dallas to Austin. 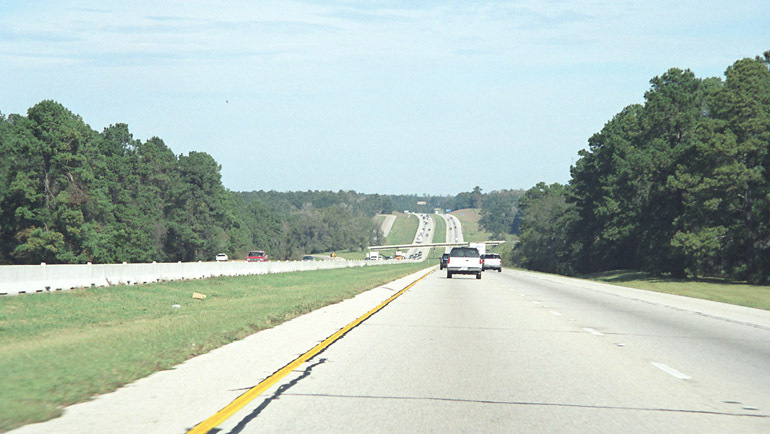 This section of Interstate crosses through four distinct ecological zones: the coastal plain, piney woods, oak woods and prairies, and blackland prairie. There aren't very many non-mountainous interstates where you can cross through so many distinct zones in about 150 miles. 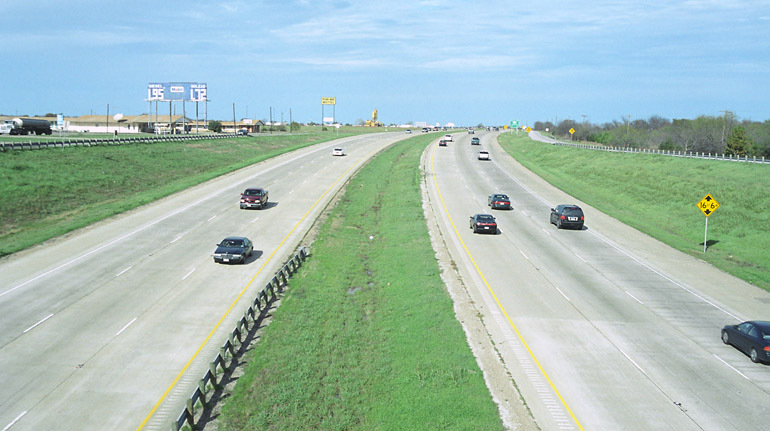 The first sections of Interstate 45 opened as US 75 from Dallas to Corsicana in the 1950s. This section was recently rebuilt to a 6-lane facility. The other sections opened as listed below. 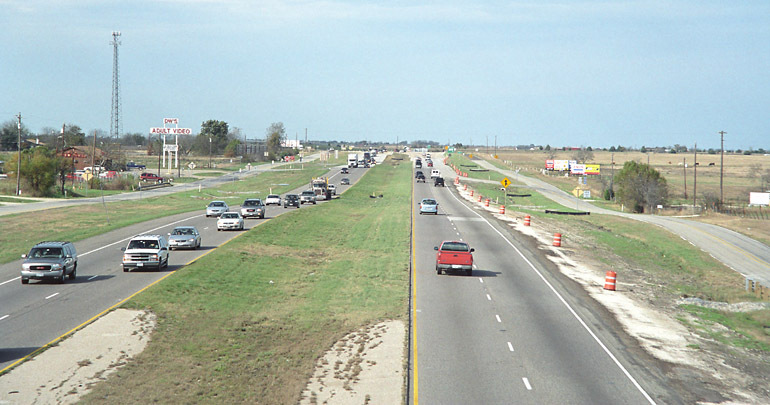 According to a report in Texas Highways magazine, the final section of US 75 from Buffalo to Streetman was extremely dangerous. Heavy traffic and the substandard design of US 75 contributed to a high fatality rate. 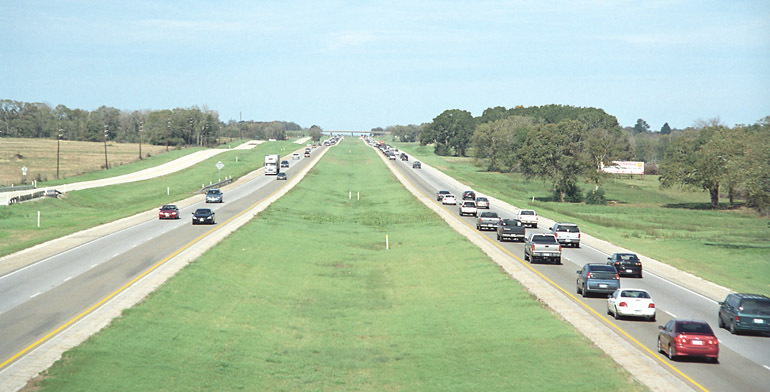 The completion of the final section in 1971 was widely hailed as a huge safety improvement on the Texas highway system. These photos were taken on the Sunday of Thanksgiving weekend, which is why the traffic was so heavy. Normally this is a pleasant drive with plenty of highway for each motorist. 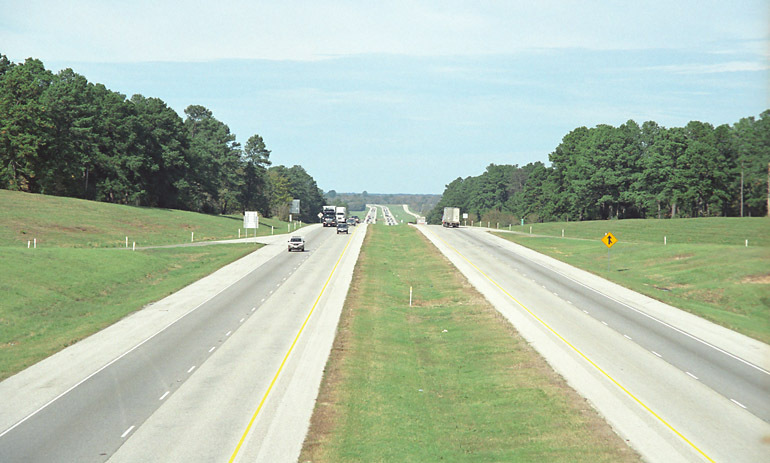 I-45 has 8 lanes to just south of Conroe. 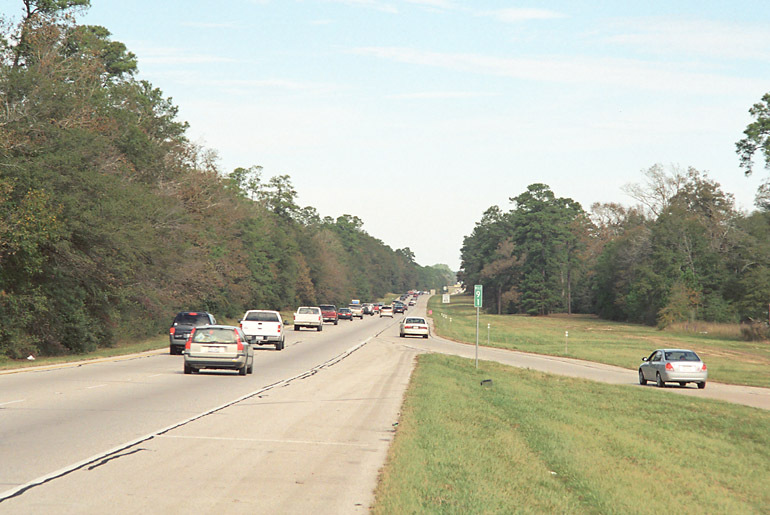 The rural section begins north of Conroe with a section featuring a nice forested median. This view is at League Line Road. At FM 830 north of Conroe. North of Willis, which is between Conroe and Huntsville. Approaching Huntsville. If you look closely you can see a small white speck directly ahead. That speck is the Sam Houston statue. 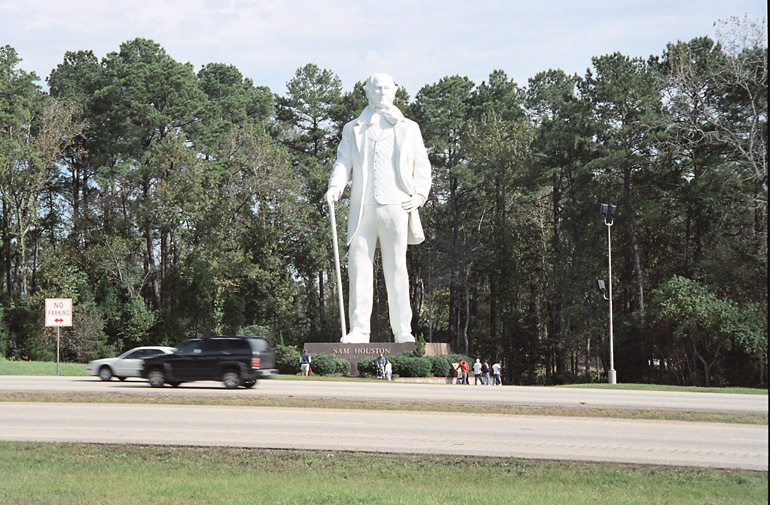 Huntsville was Sam Houston's home town (or at least where he preferred to live in Texas). 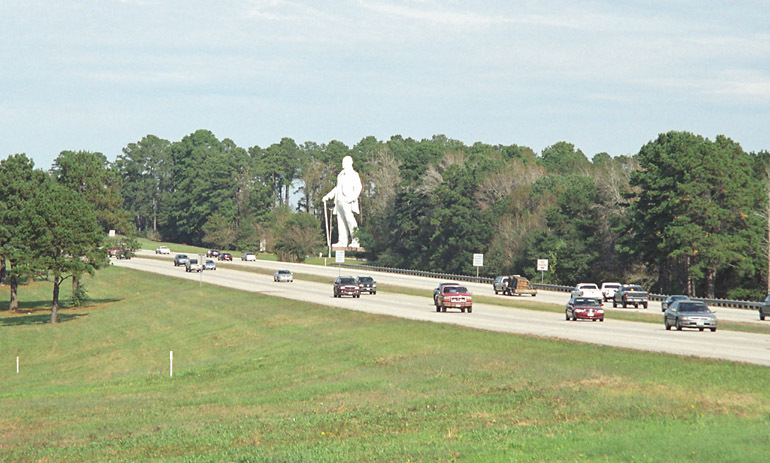 The statue is located directly adjacent to the interstate. 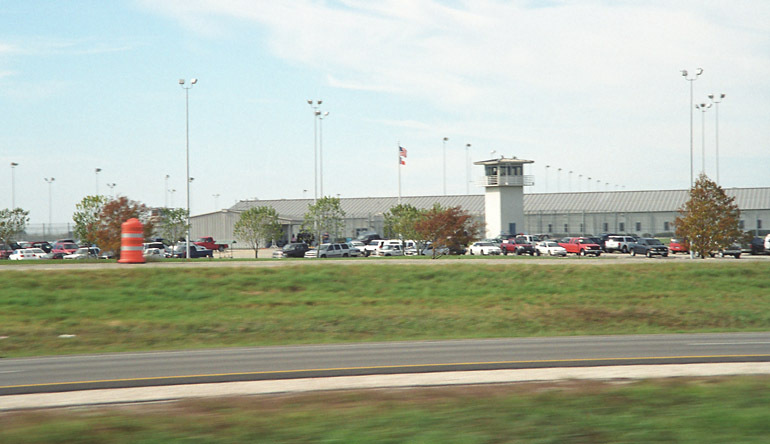 Huntsville is headquarters of the Texas prison industry, which is a large operation. Between Huntsville and Madisonville. We're still in the Pine Forest, but not for long. 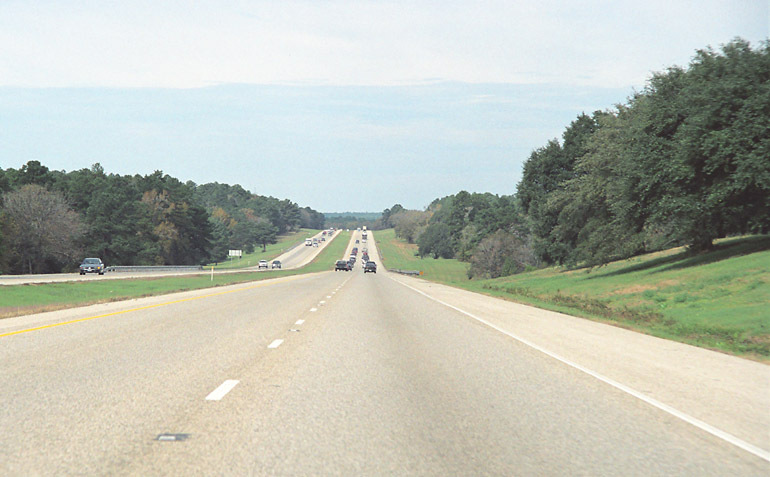 A driver's view between Huntsville and Madisonville. Once we reach Madisonville we are out of the pine forest zone and in the oak forest zone. The section from Madisonville to Fairfield is the most scenic part of the trip. Between Centerville and Buffalo. Notice the concrete pavement. This section opened in 1969 and the concrete pavement is in nearly mint condition. No spalling, and only occasional patches in the right lane. I always wonder why this concrete has held up so well for 35 years, whereas other sections have been overlaid with asphalt ever since I can remember. (Click for high resolution) Between Centerville and Buffalo. In the foreground is the frontage road. 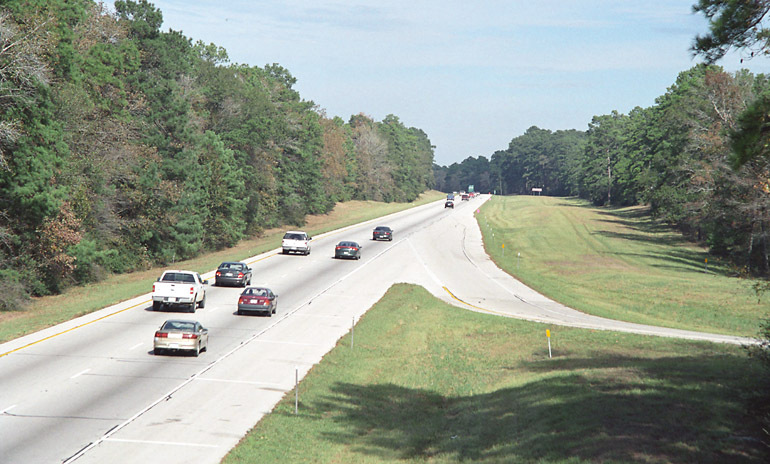 I don't know if this was the original deadly US 75, but it seems like a good candidate with its winding curves and poor geometrics. (Click for high resolution) North of Buffalo. North of Buffalo. 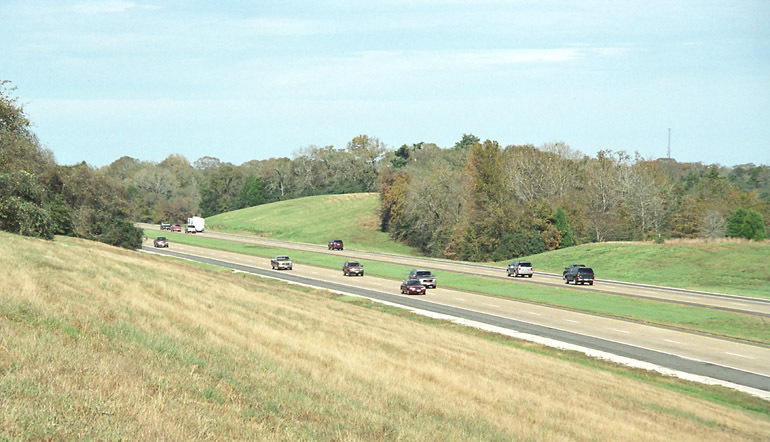 This section features a long stretch with a wide, naturally-vegetated median. Between Buffalo and Fairfield. The oak trees are getting scrubbier as we proceed north. Pavement rehabilition is in progress near Corsicana. I was driving on fresh new concrete when I took this photo. 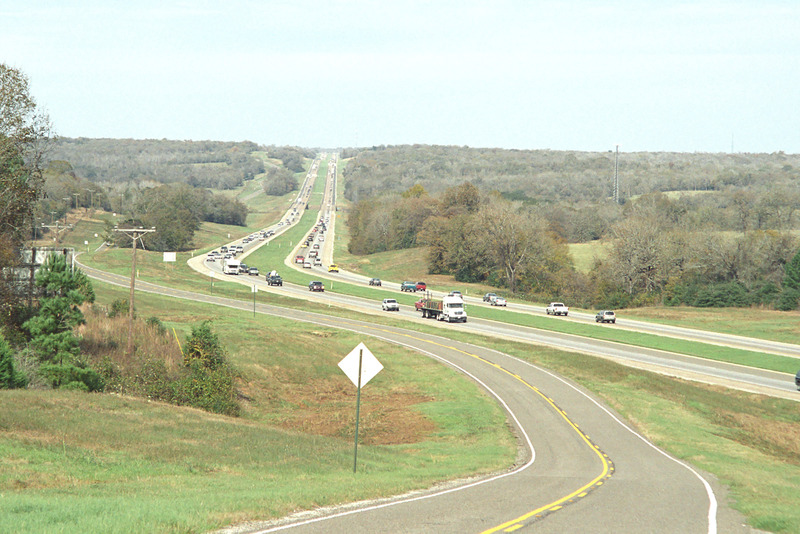 Reconstruction has been in progress from Dallas to south of Corsicana since the late 1980s. 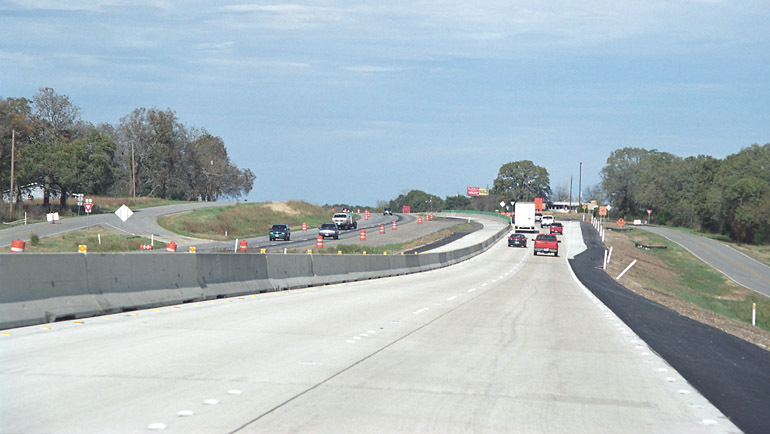 From Corsicana to Dallas, the freeway now has 6 main lanes (except for one section still under construction - see the next photo). 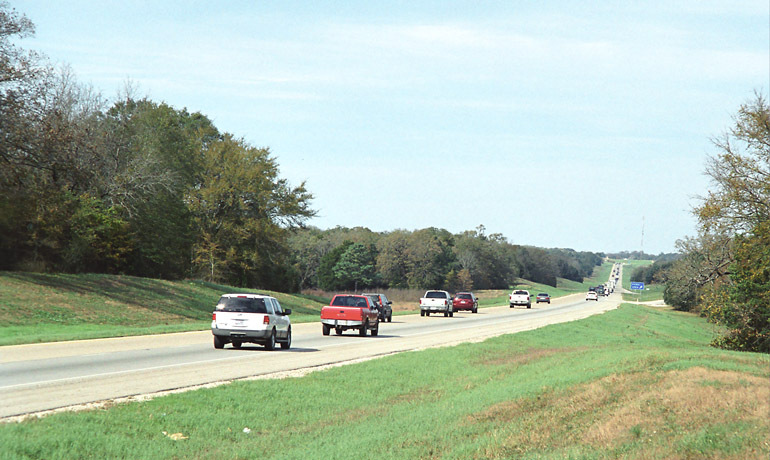 This is the last section of original highway north of Corsicana. Work is in progress to rebuild it and widen it to 6 lanes. North of Corsicana the visual quality deteriorates substantially with lots of junky buildings lining the road, like the adult video establishment in this photo. Also, we have moved out of the oak forest zone and we are now in the blackland prairie zone, so there are no trees. 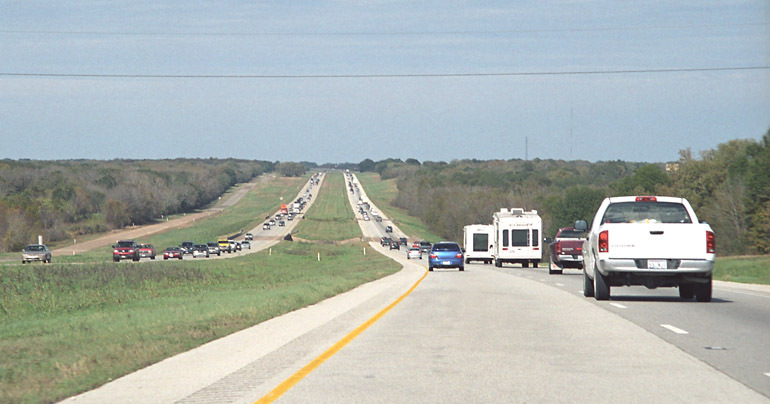 Here is a view of the modern 6-lane facility near Ennis. Another view near Ennis. Dallas is 30 miles ahead.